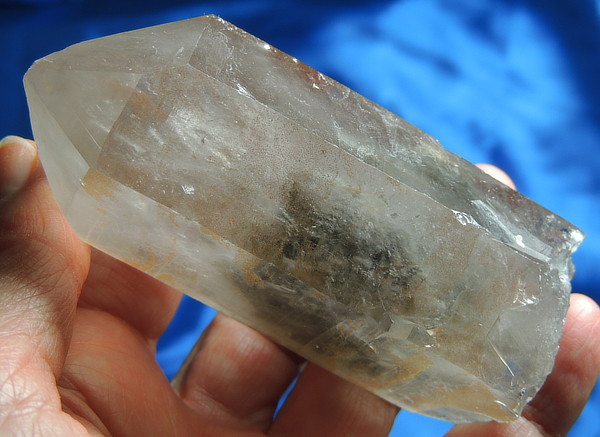 This is an evocative and mysterious 6.4 oz, 3.6“ by 1.5“ by 1.2 “quartz from Brazil with a slightly smoky, lightly mottled tangerine color. There is a is a large key on one side with what looks like golden healer that has covered a part of the dark area that once joined both crystals. There are nice starbrary glyphs on all of his sides and his base is largely healed. In the center is a dark area that looks for the world like a group of mysterious figures, standing in the fog! The light opalescence makes it hard to see exactly what it is with a loupe, but likely this is a mixture of slate and chlorite creating this wondrous apparition! You’ll find this Spirit to be bright and enticing and full of starbrary information for his special Keeper! There are some tiny dings of no significance. This Spirit is one of the most poignant and accurate in representing our Core Self. Every lifetime we live adds onto our Core Self in layers so that at any one point in time, we are the sum total of all we ever have been or will be. And interestingly, many of us are afraid of who that Core Self is and thus deny the important lessons that have been gained through centuries of physical expression. The unusually-phantomed nature of this crystal represents the yin and yang of each expression and his glyphs are the records of all that we have been (including our Star roots), have done and have seen. He teaches us to reconnect to our own Source and in doing so, each of us learns our own connection to All That Is. This is a very personal crystal and once bonded with his Keeper, should be kept in a sacred area where others will not handle him.